I believe that there is a long-lasting conflict in our lives that started probably with the first conscious, perhaps civilized yet not necessarily, man. I´ll try to resume it in one question: What weight has the tradition on our life and how much of it should we sacrifice in order to be modern and have more control and awareness? First of all, I have to say that there is a problem with this kind of question, which is that the definition for what tradition is and how far it reflects on our life can vary from one person to another. Yet, let us try to present a rough common idea suggesting that tradition is the older frame of thought, actions and codes that the different generations follow from their past (referring mainly and commonly to the sense of family honor, valor, moral, the role of a woman, kind of nutrition, clothes, social behavior and such). Modernity on the other hand can be understood as any thought or action that does not follow the established set of implicit and sometimes explicit rules of conduct (Normally I would have like to give an example like western society set of laws but we know that we’re not quite there yet when it comes to equality of gender, race and freedom of choice). Probably the most common thought of the hard-core traditionalist is that there is no need of thought. It might sound a little harsh but I guarantee that it is not my argument, but what I’ve repeatedly heard as an argument for many daily actions. That is to say, as a curious person, a large majority of the time that I ask a traditional person why he does what he does, the answer is “I don´t know” and after briefly insisting, the usual reply is “you think too much”. This, of course, can be very difficult for their younger and liberated environment that does not necessarily share this repetition of archaic set of codes (as romantic as we would like to think of them). It seems to me that what will eventually bring us closer to happiness is change and not stubbornness in beliefs. Let´s take a difficult example. Imagine two poor people, one traditionalist and the other modern. The first will save his money to buy a nice holiday dinner/something to donate in his temple/to be able to afford his daughter’s wedding. All reasons are valid and honorable, that is certain. Now, think about the poor modernist, the kind that sees the world and possibilities beyond tradition and custom. He will save his money to be able to go from time to time on a cultural experience, almost one can say adventure. Yes, he might not have a big dinner party with all his family around him, taking out one bottle of expensive poor alcohol and trying to show off as much as he can the little he has all while complaining about the poor economy and bad business. However, he might simply eat with his family a symbolic holiday dinner and later, him and all his family will be able to go to a cheap vacation to different country/buy better equipment for their biannual mountain travel/afford a diving course for his second son. It probably wouldn´t even matter if it will be a poor adventurous holiday (actually the poor travel is always the more imaginative one). And I’ll even risk saying that every vacation of that sort will be much more memorable for her and her family. The possibilities are as great as the imagination and while the traditionalist rest at home to rejoice the holiday closer to how they did for centuries, the latter invent and create her own path. Needless to say, both families receive values and mores. Another small example is something I experienced recently. A friend of mine confronted what he saw as unjust behavior of a superior (taking credit for his hard work), the superior’s argument was that this is how it was always done, telling my friend how he had to live even worst experience when he was in that situation. I was a little surprised at first because the experience was in the new technology field and both my friend and his superior were supposed to be kind just people. However, after remembering that this superior always was traditional in his views, my friend tried a different approach, he said that precisely for this reason, that it was always like that and even the superior himself doesn’t like this way of working, it is time to change it. This is perhaps what is most frightening, the change. While it seems that the traditionalist is about the security and comfort of how things were always done, the modernist tries to change (even if it doesn´t succeed for humans, modernist of traditionalist will always stay humans). It didn´t work. Why do I think change is better? Aside of the obvious reasons of innovation, improvement etc. there is also opportunity, growth and equality. Somehow I´m having difficulties to imagine a traditionalist caveman stepping out to build a city under the open sky, or to sit on small piece of wood attached to round iron circles in front and back leaving your feet in the air and riding/driving/flying. 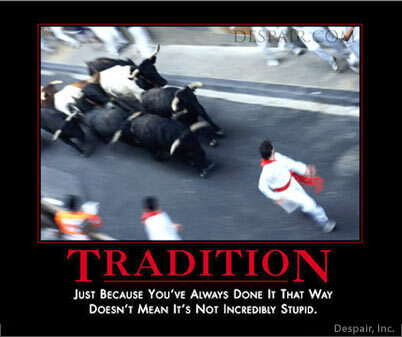 So what are some positive points for tradition? – Maintaining a structural society that provides security extracted from the known and familiar (very important for the children/sense of family value/keeping voters happy). – Bring to life warm memories that by imitation are coming back to life and make us feel happy. What are the negative points traditionalists usually have? – They are strict, usually thinking that the way they grew up is the only one and every other way of doing things is a danger for the known structure. – Unable to adapt and learn. Crucial for the younger generation that is exposed to new ideas and function from the outside but cannot break free from the older traditions. As for the negative and positive of modernity I will leave it up to you for the perspectives are endless (even sometime with false accusation as I write about in my book). No doubt, to unite and live in awareness and peace between the two is not an easy task, and certainly is not meant for everyone. I admire the people who are capable of doing it right and dichotomize important aspects in relation to that (as the imperative separation of religion from tradition). So far I only know very few families who can manage and I will be more than happy to hear about others and how they succeed in the continuous battle for harmonizing tradition with the modern life. So why is it this hard to find a constructive middle ground? One strong argument is as a friend of mine recently debated about education or control. Trying to establish a form of new age educational system that question constantly repeated, what is education and what is control over those fresh absorbing minds of our youngsters. What for some is education for other is control and vice versa. The same goes for those two universal terms: tradition and modernity. When coming down to practical day to day individual life each one chooses her path and what is black and white in the grand scheme of things, very quickly becomes gray. This is where I tend to use Trispectivism, an exterior view on the constant interaction in my mind between my use of those big words as modern and tradition and my day to day actions. Thus, if I need to resume all that view in a post, I tend to conclude that tradition is how things are and modernity is the approach for a change, improving (though not always successfully, I admit) the existing. It is the movement forward as opposed to stagnation in the known and familiar (“because that’s how we always did it”). Ever since I deconstruct that aspect in me, I began to rebuilt my perception in my own way, according to many different live’s perspectives I saw and learned around me. This sensation of power over who we are and how we think is, in my humble opinion, overwhelming.